Educational. Motivational. Interactive. And FUN! Hi, I’m school assembly presenter and library program performer Cris Johnson. You know what? I’m weird. I can admit it because I’m proud of being weird! You might know the word “weird” by its other name – diversity! Every one of us is unique and special in our own way. I’ve made it my life’s mission to reach as many kids as possible and deliver messages of good character, diversity, and making good choices to the students in these schools. I’ve created curriculum support programs on topics such as Math, American History, Science, Reading (and a SECOND reading assembly: a special Seussical Reading Adventure! ), and Ecology/Conservation as well as character development programs on Bullying Prevention, Character Education, and Drug Awareness. In short, I want kids to know and believe with their hearts and souls that each and every one of them is a wonderful, important person who can do whatever he or she wants as long as they believe in themselves and put forth the effort to learn and do amazing things. Kids deserve to feel safe, nurtured, and enabled to make their dreams come true. My assemblies are crammed from beginning to end with important messages, concepts, and lessons designed to help your students treat each other with kindness and respect, appreciate science, math, American history (and other curriculum subjects), develop a love of reading, and more. 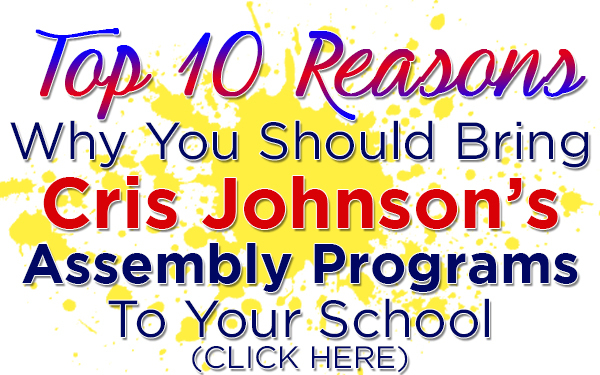 Check out clips from my assemblies! 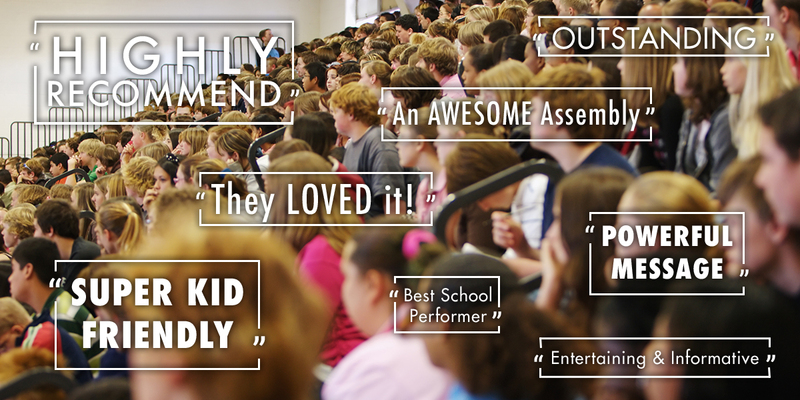 Your Students Will Love the Shows and Remember the Messages and Lessons…Guaranteed! How do I do it? Well, depending on the assembly program topic, each show might have hilarious and interactive magic, comedy, or it might have wacky ‘game show’ set pieces pitting students vs, teachers! There might be goofy sound effects, music, and more! Did I mention how “interactive” my school assemblies are? Depending on the program, I might get a dozen kids or more on stage to help! Using all of these different presentational ‘tools’ means I keep the kids riveted from start to finish – they never take their eyes off me because they can’t wait to see what happens next! Now, I know what you’re thinking: “There are a LOT of choices for elementary school assembly presenters out there – how do I know this guy’s any good?” I’m glad you asked. I’m not famous – I’m not Bill Nye, even though I have an award-winning Science Assembly and a hilariously interactive Math Assembly. I’m not David Copperfield or Criss Angel, even though I use amazing, visual, and hilarious magic to teach character education and bully-proofing concepts. I’ve never performed in Las Vegas, even though you’ll love the full color sets I bring with every assembly program that are designed to turn an ordinary assembly program into a complete theatrical experience for your students. In short, if you don’t think I delivered amazing lessons and messages to your students in a fun, interactive, entertaining manner, not only will I cheerfully refund your check, but I will also donate $500 to your school’s PTA/PTO. Oh, and after having performed 200 shows a year for the past 20 years in 36 states across the United States, NO ONE has ever requested a refund. Many elementary schools and public library clients have me come back year after year. So, check out my entire site – with over a dozen different school assembly topics (and 12 library shows, too!) 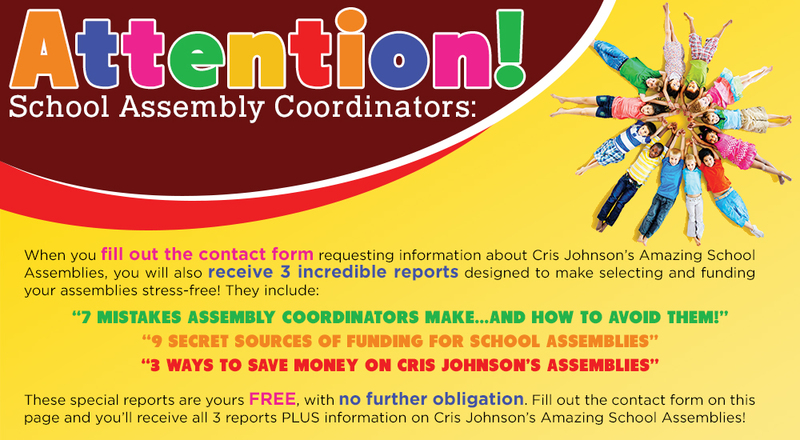 including “just for fun” field day/family night/reward options, there’s plenty of assembly topics that will benefit YOUR school! You can fill out a contact form (they’re all over the place on this site) or call me at (716) 940-8963 (that’s my cell phone). Even though I’m on the road a lot, I will get back to you as soon as I can! P.S. I almost forgot – because I am so busy, I sometimes book up six months to a year in advance, especially for ‘prime slots’ in the school year such as Read Across America, so contact me right away to see if your preferred date is open!